Equine herpesvirus type 1 (EHV-1) could be driven by pollen, new research suggests. Well-known for its ability to trigger allergies and asthma, little is known about how pollen interacts with respiratory membranes. Pollens release proteins and allergens when they come into contact with moisture in the respiratory tract of animals and people. The proteins include proteases, which break down proteins. The study was conducted by Drs. Jolien Van Cleemput, Katrien Poelaert, Francis Impens, Wim Van den Broeck, Kris Gevaert and Hans Nauwynck from Ghent University, and Kathlyn Laval from Princeton University. The scientists used pollen proteases of white birch, hazel and Kentucky bluegrass to investigate if the proteases impair the epithelial barrier of the respiratory tract. Equine tissue samples showed that the proteases do damage the epithelial cells in the respiratory tract, which increases the opportunity for EHV-1 to infect the damaged tissue. 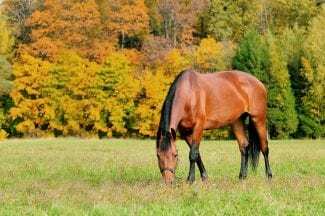 EHV-1 can cause things as minor as a respiratory issues or as major as abortion in mares; it can also cause neurologic issues so intense that euthanasia may be the best option for the affected horse. The researchers said that the damage to the tissues from the pollen-derived proteases is irreversible. The scientists supported their findings by noting that EHV-1 infections typically occur during late winter and spring, when pollen concentrations peak. Other airborne pathogens may also be able to take advantage of this damaged tissue, they note. This entry was posted in Horse Care, NL List and tagged damage, ehv-1, equine herpesvirus, hazel, infection, kentucky bluegrass, mucosa, neurologic issues, pollen, proteases, respiratory, tissue, white birch by Paulick Report Staff. Bookmark the permalink.